Incorporated in 2010, We "Hi-Guard Steel Doors Solution", are among the prominent Manufacturers of a wide range of Safety And Security Door, Stainless Steel Door, Bathroom Door, Interior Door, Soundproof Door, etc. These doors made by us are highly appreciated and asked for, in the market because of their attractive designs, durability and sturdy construction. The highly developed, state-of-the-art infrastructural facility we own is known for its uniqueness. For the purpose of enabling hassle-free operations, we have divided our infrastructure into several units. These units, headed by trained employees, work in a united manner, to achieve various organizational objectives within the predetermined time frame. The products manufactured by us, are sent to our quality team, who scrutinize them thoroughly and eliminate the defective products using their high precision. In addition, our highly ethical working habits and strict adherence to industrial guidelines have helped us to generate a huge client base. Under the leadership of Mr. Uday Taluja, we have achieved unthinkable success within just a few years of our existence. His technical and practical knowledge of this field, when combined, acts an asset to our firm. Further, special care is taken of the employees by providing them regular training and incentives. Maintaining high-quality standard is something of high importance to us. Thus, we manufacture all our products as per the set industrial norms, using fine quality raw materials and modern machines. 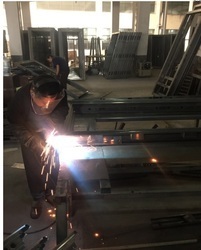 Post the manufacturing process, we send these doors to our team of skilled quality analysts, who with high precision, scrutinize these products and eliminate the manufacturing defects so discovered. We have a state-of-the-art infrastructure, which is praised widely for its several facilities and amenities. This facility is laced with modernized equipment and machinery that confirm to the latest technology. Our infrastructural facility is upgraded on a regular basis, in order to stay ahead in the competition. The facility is divided into several units for a smoother functioning, which is achieved by boost in productivity and improvement in quality. At Hi-Guard Steel Doors Solution, we take pride in giving the maximum credit of our success to our team of trained and experienced employees. These employees work efficiently and diligently to achieve a number of organizational goals. In order to achieve smooth operations, we have divided our team of expert professionals into several groups. These units work in a harmonized manner to develop new and innovative ideas for boosting productivity and standardizing quality. Search and research are the essence of mankind. The resultant awareness leads to any individuals physical, psychological, social and spiritual evolution. Extensive scientific and medical research as proved that the concept of rehabilitation is not limited to physical rehabilitation. Ultimate reabiliation for the human race is one that can recognise & simultaneously encompass all the above elements that make an individual a complete personality. Be fair, transparent and honest in all our transactions. Foster a culture of mutual trust, respect and knowledge sharing. Maintain the highest standard of corporate governance. Be a socially and environmentally responsible company. To be universally respected and admired for customer service, operational excellence, consistent quality and ethical practices. Due to our innovation, quality product, exceptional customer service & commitment to excellence makes us the brand that consumers, remodelers & builders choose when creating homes of distinction. Hi-Guard Steel Doors Solution ( A Brand of Mehar Overseas ) was established in 2010 to identify the need of security and providing steel security doors solution that suits the best technical specifications and economically priced. Since then we have only laid emphasis on improving the quality and range of our product. Our quality, commitment & impeccable service sets us apart from rest of the industry and allows us to provide the complete range of products so that we may cater the individual tastes of every customer. This transformation is manifested in the pursuit of excellence and innovation at all levels of the company. Continuous improvement and value creation for its customers are a part of the Hi-Guard culture.And the result is our strong footing in many major cities across India right up to the far east.We say it is just the beginning.